Are you the type of person who wakes up as soon as their alarm goes off, jumps out of bed, and is ready to take on the day? Or are you more the slow wakeup type, needing a few extra minutes and a warm drink before you are ready to face whatever the day holds? Whatever type of person you are, one thing is clear when your alarm goes off in the morning: you must get out of bed, start the day, and be productive at some point. But what if you decided to stay in bed? Ignored your alarm? Avoided the responsibilities of the day? There would definitely be ramifications! Your spouse might be upset that you were not helping take the kids to school, your friends might be annoyed that you stood them up for carpooling, and your boss definitely would not approve of you taking a day off unwarranted. What of the church? In recent years, world church leadership has issued a special call for revival and reformation. However, are we as a church heeding the call, or are we pretending that we don’t hear the alarm? A global study conducted by the Institute for Church Ministry (2013) asked pastors around the world how this call to action affected them personally. Sixty-seven percent of respondents indicated that it caused them to pay more attention to prayer and Bible study and 59% indicated that it had deepened their spiritual life. However, 9% indicated that the call was not that important to them personally, while 6% indicated that they had not heard much from world church leadership on the topic. This call to revival and reformation has also impacted church congregations. When pastors were asked about how this call has impacted their parishioners, 41% indicated that they had seen an increase in attendance to prayer meetings or small groups. 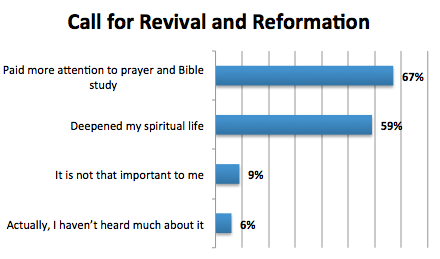 Thirty-eight percent indicated that the congregation had heard a sermon (or sermons, as the case may be) on revival. However, for almost one-fourth (22%) of congregations, there has been very little change or focus on the topic. As you can see this call for revival and reformation has been largely beneficial, but is not universal. One key point to consider is that this call for reformation and revival is not just coming from the world church leadership or from the General Conference itself. In Revelation 3:2-3, we read, “Wake up, and strengthen what remains and is about to die, for I have not found your works complete in the sight of my God. Remember, then, what you received and heard. Keep it, and repent. If you will not wake up, I will come like a thief, and you will not know at what hour I will come against you.” This wakeup call is one that has resounded through the ages! Spend more time in the Word. The Bible is like a compass that points us to Jesus. By spending time reading and studying the Bible, we are able to understand more fully our place in this world, as well as in the world to come. As we become closer to Jesus, we are better able to radiate His love to others. Strengthen your prayer life. If you love someone, you want to spend time with them; quality time and communication are central to any healthy relationship. The same is true for our relationship with Jesus. Prayer and communion with Jesus are not only central to having a strong spiritual life but they also can be the catalyst for a personal revival. Increase your time spent in community. As important as personal revival is, it is vital that we do not keep the good news of Jesus and His gift of salvation to ourselves. As we draw closer to Jesus and become more excited about who He is, we should be more willing and excited to share the happy news with those all around us – specifically those who haven’t met Him yet. Minister to the others. The more involved we become in the lives of others, the better acquainted we will become with their needs. Just as Jesus ministered first to peoples’ physical needs and then their spiritual needs, so we ought to do the same. Without an alarm, many would likely sleep well into the day, missing out on multiple opportunities. It’s time for us to “wake up,” and prepare ourselves – and others – for spending eternity with Jesus!